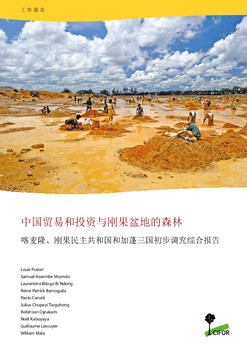 Since 2000 and the implementation of Chinas going abroad policy, mainland Chinese state-owned and private companies have significantly increased their interests in the resources and investment opportunities of the Congo Basin, bringing new opportunities as well as potential social and environmental costs. This report is a synthesis of some main findings of preliminary scoping studies conducted by CIFOR and partners in Cameroon, Democratic Republic of Congo and Gabon. It focuses on how Chinese trade and investment in the forestry, mining and agricultural sectors might relate to effects on forests and forest-dependent communities in the region. All studies were conducted under the CIFOR project Chinese trade and investment in Africa: Assessing and governing trade-offs to national economies, local livelihoods and forest ecosystems, initiated in 2010. The scoping studies yielded useful results, including an increased understanding of the main trends in natural resources trade between the target countries and China, and the major land-based productive sectors targeted by Chinese investors. The studies also considered the role of national agencies tasked with promoting investment and overseeing corporate adherence to environmental and social requirements, and provided a better understanding of the informal processes surrounding investment and acquisition of land and other resources. Authors: Putzel, L.; Assembe Mvondo, S.; Ndong, L.B.B. ; Banioguila, R.P. ; Cerutti, P.O. ; Tieguhong, J.C.; Djeukam, R.; Kabuyaya, N.; Lescuyer, G.; Mala, W.A.